The driving test hasn't changed. It still works the same as it did last week. There aren't any new rules or processes. So why change the content? We started looking at feedback from users, data from Google Analytics and talking to the team at the Driver and Vehicle Standards Agency (DVSA). With over 1.5 million driving tests carried out each year, there was plenty to go on. So we set about fixing these issues. There's currently a longer wait to get a driving test than DVSA would like. They’re working hard to reduce it. 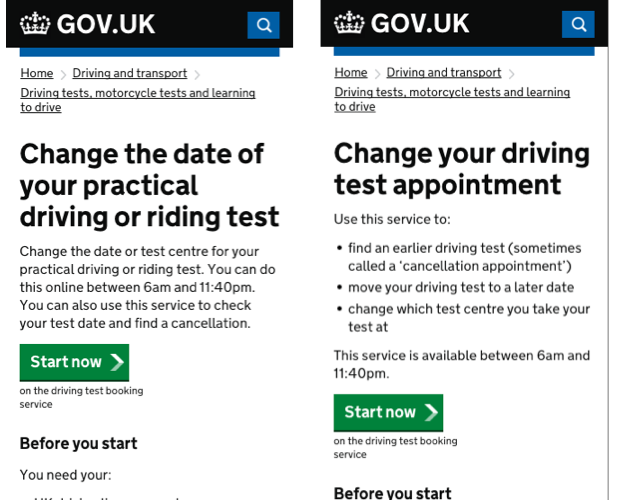 It means users have to book a driving test date a couple of months away. If they want to get an earlier appointment, they can come back to GOV.UK and see if something sooner has become available. So there are lots more searches for ‘earlier driving test’ and similar terms. The service page previously mentioned this in passing, but we've now put this up front so it's clearer to users. It should help the page to get ranked higher in results for people searching for an earlier test. We've also published new content, like this page about upgrading an automatic car driving licence. We found that users were searching for how to do this, but the complete process wasn't explained in a single place on the site. Now it is. 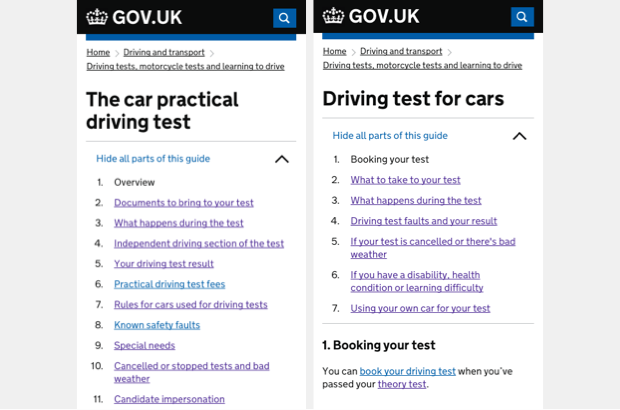 Just 3 years ago, 28.5% of people viewing the driving test guide were using a mobile device or tablet. That's now at 62.0%. 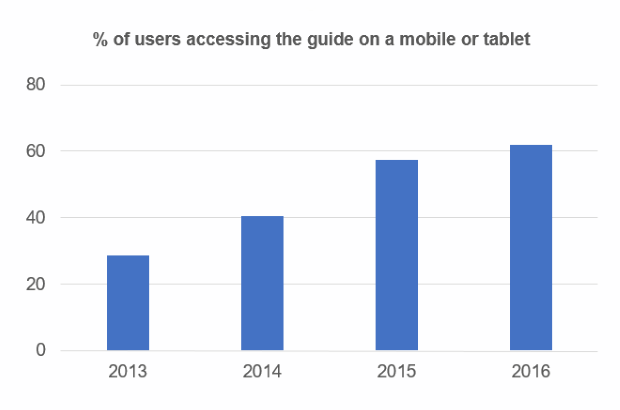 Most users on a mobile device move through the guide from one part to the next. Users on a desktop tend to move around the parts a bit more freely. The version of the guide we've just replaced had 11 parts to click through. The new one has 7. It makes it quicker and easier for mobile users to go through the guide. We're also relying less on related links. These appear in the right-hand column on a desktop. But on a mobile, they wrap under the main body. We found that mobile users are less likely to use them, so we've made sure that the body text has relevant links in it. We used Chrome DevTools' Device Mode as we designed this new version of the guide. We worked as little as possible in a desktop view. We wanted to see the content exactly as most users would. 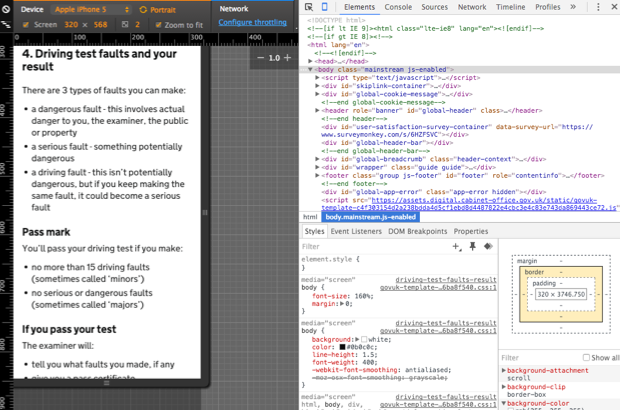 Using Chrome DevTools' Device Mode lets you see how the content will look across a range of devices. The old guide about the driving test was published at www.gov.uk/practical-driving-test-for-cars. Imagine trying to give that out over the phone! Individual guide part URLs get even longer. For example, the part about using your own car for the test was www.gov.uk/practical-driving-test-for-cars/rules-for-cars-used-for-driving-tests. So we've made the URLs shorter and more memorable. The guide is now at www.gov.uk/driving-test, and the part about using your own car is at www.gov.uk/driving-test/using-your-own-car. And of course, all the old links are redirecting to the new. The next thing we’re going to do is measure how things have improved. We want to make sure that we've made it easier to find services, and that mobile users are having a better experience. When we've got enough data, we'll start analysing and do a follow-up blog post so you can see what happened. The GOV.UK content team tries to spend 20% of its time doing improvement work like this. So if you work in a department or agency and want to work with us to improve something, let us know.